I am looking at the subject guitar from 1988. Would anyone here have any pictures of comparable OBG's please? 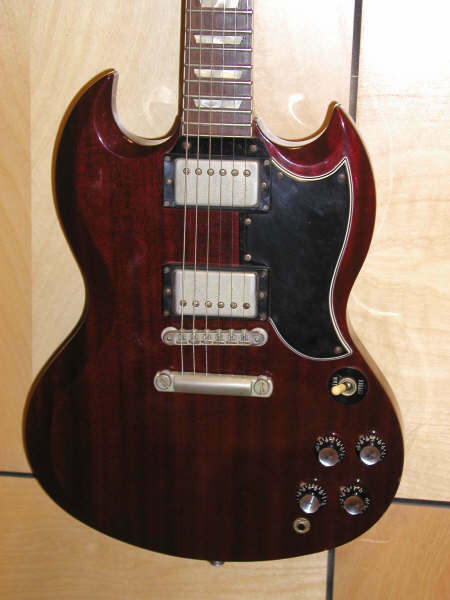 The guitar I am considering is incredible sounding with, I presume, Gibson '57 PAF Classics in it. Hi. I've a couple-three OBG SGs. I know saying that I love them isn't a very scientific recommendation but it's honest. They're light as a feather and are great sounding/playing guitars. My cherry and white ones are both '88's. The black one's a '92. Villager used to have a white one with fret-edge binding and I've also seen one with 3 PU's. Like any good SG, the necks, particularly around the headstock, are susceptible to breakage (but unless ridiculously severe, satisfactorily fixable) if you bang them into something. The newer one has this type of pickup. It's been awhile since I cracked the other two open but I seem to remember that they have PAFs. Innadaze: Thank you VERY MUCH! You have a gorgeous collection. The guitar that I'm looking at is far from pristine but does have a genuine reliced experience. The neck, as you say, is slim, wide and fast. But what really draws me to it is the tone. Here are a couple of pictures of the subject guitar. I cannot believe the playability and tone. The guitar is far from mint but appropriately "reliced" from natural use. I love the vibe. That's not bad at all! Before posting the pics, when you said it looked "relic'd" I was thinking it would be like a lot of the OBG SGs I've seen that were pretty chewed up and either played real hard or not stored/maintained very well or both. Tarnished hardware's no big deal, some guys like the vintage look. 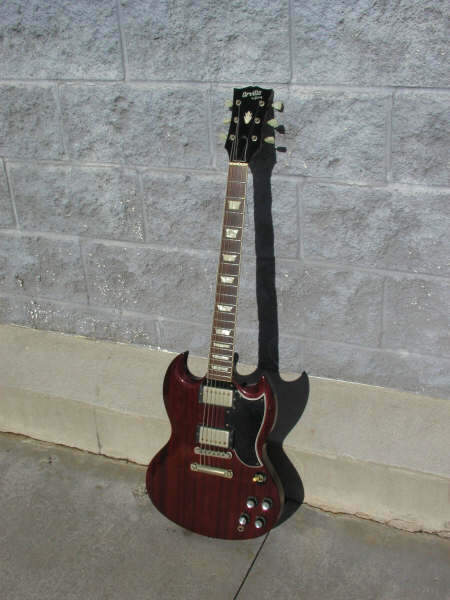 As long as it has no playability or sound issues, stays in tune and can be setup properly you're ready to rock on out. The nitro on the OBGs cleans up very nicely. At least half of all my OBGs needed TLC when I first got them. Usually a good clean up is all I do and leave the hardware until I get tired of looking at it (or just lose the covers altogether like I've done to about half my LPs). Putting on new PU covers, bridge stuff (if it needs it), knobs, rings and/or OEM or upgrade tuners really transforms the way they look. Just doing a fresh setup and new strings on any OBG will blow you away at how damn good these guitars are and not even taking into consideration how well done the fit and finish is, A/B'ing them back to back (sound and play-wise) with any 3-5K+ Am Gibson is shocking. Innadaze, it does have some bumps and bruises on the back. For now, I'll clean her up and leave the tarnished look on the hardware. I dig that vibe, as they say. btw, I did a side by side with a new Gibson '61/'62 Reissue and a new '59 LP Reissue. I won't put the others down, however, this OBG did not take a back seat. The power and clarity of these twenty-year old pickups surprised me. Thanks for the input. I did buy it and like it pretty well as is. All I can say is that they are the real deal. Just a question for you... does yours have a long-tenon? 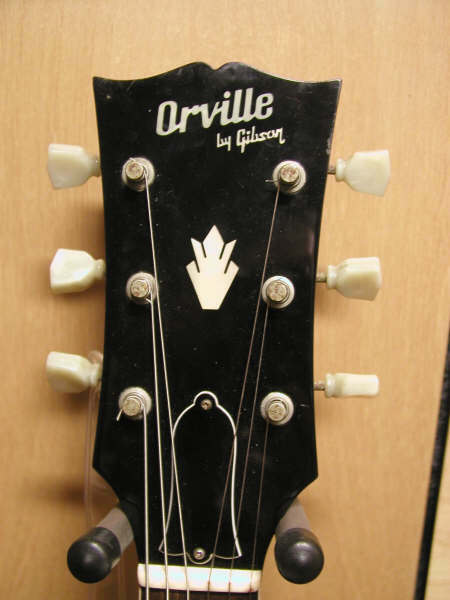 And are the pups the stamped-engraved Gibson USA or the circuit board HB-R/L (as mine were)? 3pupLPC: I haven't torn it down yet. I got it from a trusted friend who got it from a famed Nashville Guitar guy. Personally, the long tenon thing seems overrated to me. I can't hear the difference. I traded Joe out of this SG (who is a wonderful guy to deal with, BTW). The pickups are, in fact, the Bill Lawrence designed circuitboard pickups. No big deal to me. 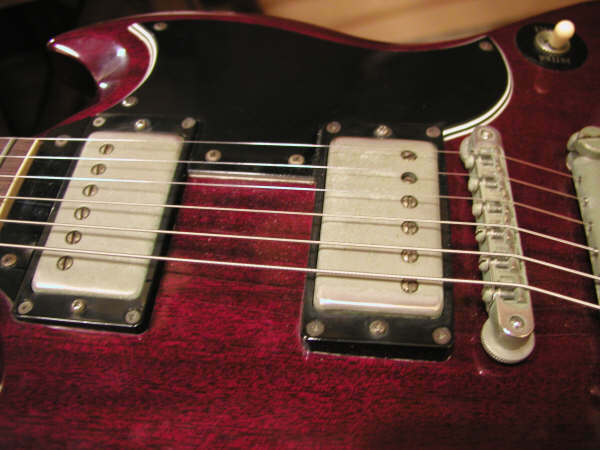 Never having met a Gibby pickup that I like (I wouldn't have liked them if they were 57 classics, either), I had decided to swap some GFS Mean 90 pickups (similar to SD Phat Cats) as I really want a mahogany slab P90 guitar and I have multiple dual humbucker guitars. WOW, what an improvement. I can see how 3pupLPC obsesses over his. Nothing like a pair of p90's for unbridled rock tones. Quick pick of the SG with the Mean 90's installed. Lookin' good! I know one thing, that neck and action are really sweet. I love mahogany and P90's. That ought to be great Mr. currypowder, my friend. I didn't end up too bad either, iykwim. Holy Schneike! I have to agree with you, 3pup, a mahogany slab p-90 guitar is hard to beat. Cleans up nice by rolling the volume off a bit. I have a couple of other P90 guitars, but they all have maple tops. This one is pure Rock & Roll. BTW, I love the GFS pickups. Nice vintage output and sound (IMO) exactly how a good p90 should. The set was about half of what a set of SD Phat Cats would have run. Please send more cash. LOL! I'm glad the thumb finally healed up.